Francis Manapul has been a favourite of the House for a very long time now. His use of colour and composition has always stood out from so many other comic covers which is why his covers have been featured on a few occasions on this site. This cover is no different and takes the central characters of the comic and places them under the careless wings of Batman. Of course this is not our Bruce but Gordon and the new insignia welcomes a seamless mergence of man and city. The bats appearing from below the reddened bat symbol is a delicate touch leading into a cityscape scene with Bullock at the forefront. Manapul has always been very imaginative in form and structure and has often experimented, not just on his covers but also some of the comics themselves; The Flash instantly springs to mind. I find it interesting how the title is yellow, the background is red and Batman is a blue-black colour, and yet it doesn’t seem garish. It almost alludes to the pop culture art movement, especially as it is essentially a poster picture. There is a slight juxtaposition because the nightscape is beautifully rendered with respect to the shades moving in and out of the different personas. 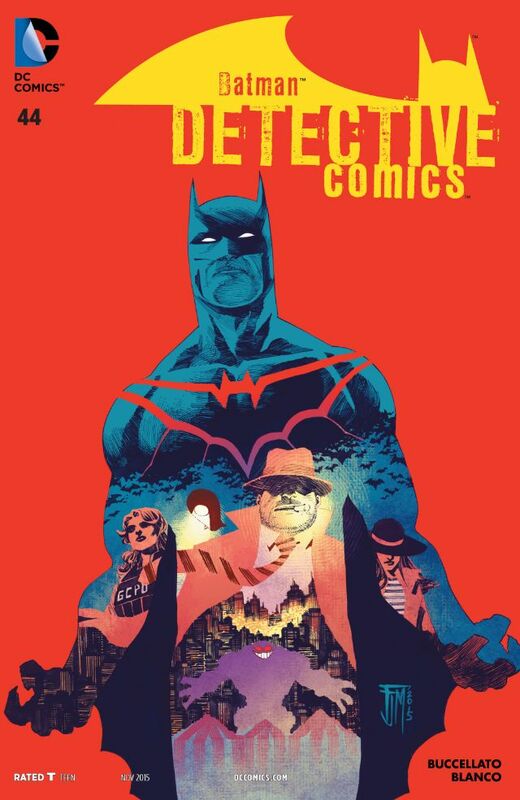 It is a stunning cover to, probably the best Bat book out there at this moment.